Amber typically is found in shades of yellow to orange-brown, although white, green, blue, and black specimens appear. 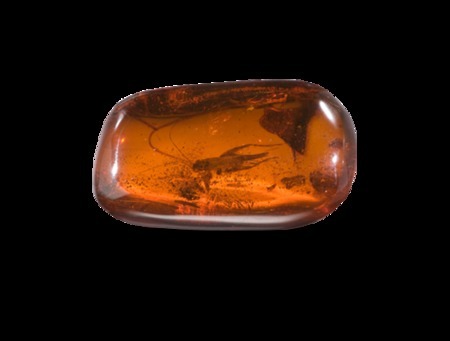 Remains of insects or plant matter suspended within Amber’s structure are seen by metaphysical healers as indicators of the gem’s healing power. The best-known Amber comes from the coast of the Baltic Sea. Other locations where it’s found are the Dominican Republic, Mexico, Burma, and Indonesia. Prized for its ability to draw pain from the physical body, Amber is said to transform negative energy into positive energy. It cleanses the environment, benefitting convalescence, easing depression, and soothing grief. Amber reduces stress and boosts confidence. It’s thought to help with organs of elimination (liver, kidneys, etc. ), as well as the throat, colds, dental pain, and other issues. Amber is a natural birthstone for those born in midsummer (July 22-Aug. 21) and a zodiac sign for Taurus (April 20-May 20). According to legend, Amber was created by tears of seabirds or goddesses. Ancient peoples saw it as droplets of the setting sun; in the Far East, it was believed to be a metamorphosis of the souls of tigers. Native Americans said Amber represented the east wind of grandfather sun. Roman author Pliny wrote that Amber necklaces were hung around children’s necks to protect them from witchcraft and ease teething pain. Amber is said to heal the Solar Plexus Chakra (controlling the immune and digestive systems) as well as the Sacral Chakra (the body’s life force center regulating intuition). Feng Shui experts classify Amber as Water energy (quiet strength and purification) and recommend placing it in the north area of a home or room. 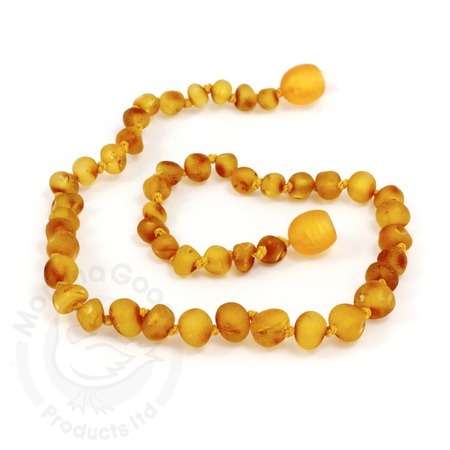 Besides its use in jewelry, Amber has seen a growing popularity recently as a teething pain reliever for babies (though experts warn of the choking hazard associated with placing necklaces on little ones), a pain and anxiety reliever for adults, and as the subject of intrigue. This entry was posted in Sunday's Gem and tagged amber gemstones, healing gemstones, metaphysical properties of amber. Bookmark the permalink. Debbie, such synchronicity because I was just talking about the gemstone, Amber, with a client at work. We were talking about how much we love the color of Amber. I also have a friend who has just started making her own gemstone jewelry and recently created an Amber pendant. Yes, you’re absolutely right about that, which was something I learned back when I first started my interest in gemstones. I really like the necklace you displayed in this post because it shows Amber in its natural state. I also love the first photo you shared at the top of the post because you can clearly see what looks to be a tiny cricket inside the stone! Thanks so much for sharing, my friend. Really enjoy these posts! Ron, I’m delighted you’re enjoying these gemstone posts! I’m learning a lot about these different stones, too, and I’m amazed at just how much is out there to learn. I think I like the idea of Amber better than I like the actual stones. Something about wearing a centuries-old bug around my neck just doesn’t sit well! And I can’t fathom looping something like an Amber necklace around an infant’s neck, even if the poor thing is screaming its head off from teething pain. Numzit works so much better! I do love the color of Amber and to have an insect inside is extra special. I like the color, too. It feels happy and looks enough like gold for me to think of it as ‘rich.’ The bug? Not so much. I know it’s been dead for ages, but yuck! I imagine a bug so sleepy that it takes a nap and is covered by sap. Ten thousand years later it is forever memorialized in a chunk of Amber. Fascinating. I had some necklaces made of amber beads that I got in Africa from traders. It wasn’t a clear amber like you’ve shown here, but it was very pretty. Over the years I’ve given away or sold a good bit of my African stuff, so I don’t still have the amber, but it’s just as well. I couldn’t wear it — the pieces were as big as the round pieces that come with Tinker Toys! Those were some seriously big pieces, Linda! I wouldn’t want anything that heavy hanging around my neck either. You must have had some lovely jewelry though. I don’t have any Amber. I have some Amber-colored beads, but they’re too hard to be genuine. Maybe that’s just as well since the stuff is so delicate that it doesn’t seem practical.